RURAL AMERICA’S NEW CASH CROP – RENEWABLE ENERGY | "Global Possibilities"
A federal program is bringing solar energy and other green technology to farms and small communities. A winery with a solar array in rural Oregon. A greenhouse in Montana tapping geothermal energy. A farm in Kansas that deployed an energy-efficient irrigation system. These are just a few of the more than 15,000 small businesses and family farms around the country that have received a clean-energy boost from an unexpected source: the United States Department of Agriculture. The funding to make these projects a reality comes in part from the USDA’s Rural Energy for America Program, which offers small businesses and farms—often left on the sidelines when it comes to new technology—the opportunity to invest in either renewable energy sources or energy-efficient equipment. Collectively, the REAP projects installed to date have reduced the greenhouse emissions of these rural businesses by more than 5 million metric tons per year. “That’s the equivalent to removing more than a million cars from the year annually,” said Samuel Rikkers, administrator of the USDA Rural Business-Cooperative Service, which runs the program. Many of these projects may not have been possible without REAP assistance. Jason Delaney, landscape project manager at Delany’s Landscape Center in Polson, Montana, said the geothermal heat pump the company installed at its new retail building at first looked prohibitively expensive. “The grant and all of the rebates from the power company made it so that it’s actually a really good thing for us,” he said. The system costs about $50 a month in electric costs, compared with $200 to $300 a month for a propane-fueled boiler. The system is expected to pay for itself in four to five years, compared with 10 years without REAP assistance. “It’s good for the business and good for the environment,” Delaney said. REAP isn’t a “free ride,” Rikkers pointed out. Program grants can cover up to 25 percent of a project’s cost; the recipient must provide the rest. Loan guarantees address 90 percent of a project’s funding, which enables banks to offer lower rates and longer repayment terms. All told, REAP has provided more than $345 million in grants and $430 million in loan guarantees since President Barack Obama took office in 2009. Pattie Björnson, co-owner of Björnson Vineyard in Salem, Oregon, said the winery has installed a hybrid solar system that generates electricity and hot water. “Heating and cooling a winery is extremely expensive,” she said. 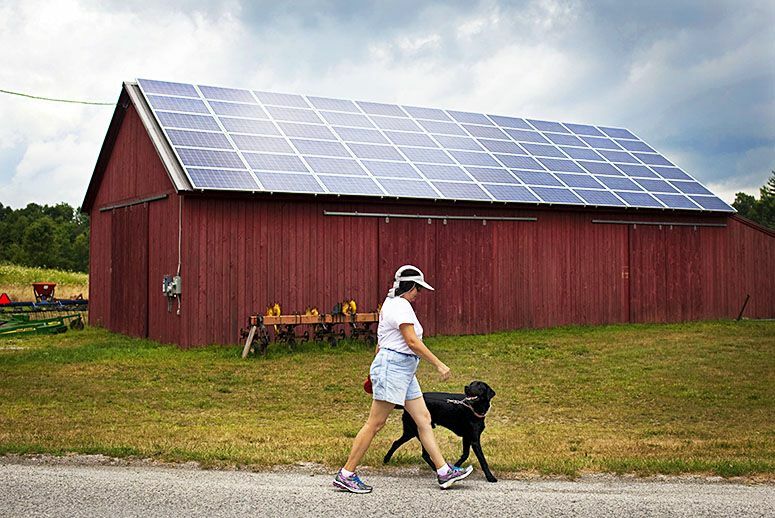 “It was a lot of work writing the grant application, but it was worth it.” She said the local energy utility buys the energy produced by the winery’s solar photovoltaic system, which pays the vineyard’s entire electric bill during summer months. He added that the investment in new technologies helps to boost small-town economies at a time when many young people are leaving for cities. “It keeps these rural towns and communities really vibrant, so we’re not a country dotted by these very empty places,” he said.